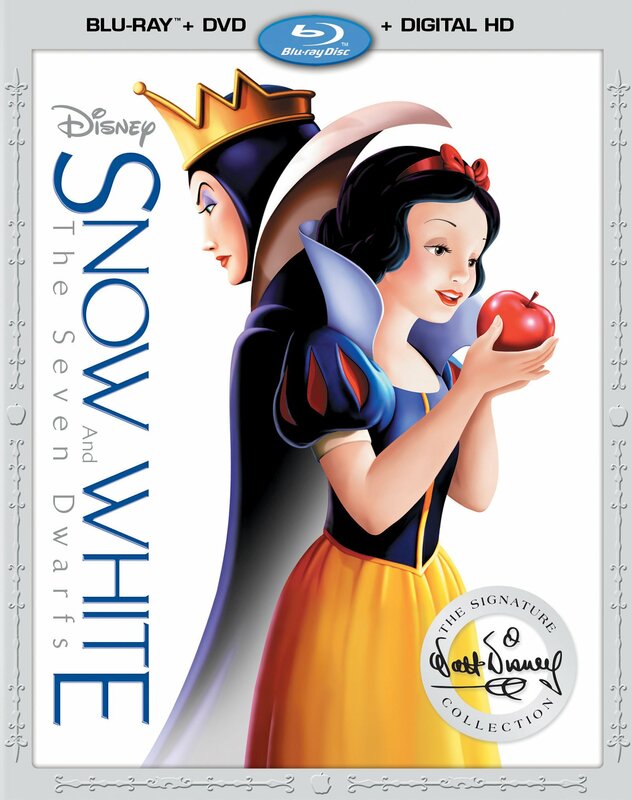 Snow White and the Seven Dwarfs , Disney's first ever feature length animated movie, has recently received another blu-ray release, this time called the Signature Collection (the previous release was called the Diamond Edition). It looks exactly the same as the Diamond Edition, which is to say it looks fantastic as they did a great job restoring the film for the original blu-ray release. There is also a feature called DisneyView which puts artwork on either side of the screen instead of plain black bars which makes the whole thing look a lot nicer on widescreen televisions. I didn't have a blu-ray player when I got the Diamond Edition so it was great to see this in high definition for the first time, even if it's not my favorite Disney film. The In Walt's Words featurette is really cool and is Walt Disney talking about the movie while we watch old footage and still frames. Unfortunately it's short, less than five minutes. The Iconography featurette is a bit longer and not nearly as cool. It's just about how some people are cashing in on Snow White. The other featurette I didn't find very interesting was the one with Sofia Carson. That didn't really have anything of importance to say and really just felt like a promotion of whatever show she happens to be on. The @DisneyAnimation wasn't bad, though I like watching artists. Then there was the deleted scene where the prince meets Snow White, and this was told in storyboard format. I liked it but thought it would have been cooler if they would have actually fully animated it. It's under 4 minutes long and it's not like they don't have the money. The Snow White in 70 Seconds is a wrap about the plot of the movie and it wasn't my cup of tea. Okay, on to the movie. So you probably know the story already. Before watching it, I thought I knew just the basics and was missing a lot, but after watching it, I realized nope, what I thought was the basics was actually the entire story... as there isn't much story here. The princess Snow White has an evil stepmother queen who gets all jealous after a magic mirror says that Snow White is hotter than her, so she orders a hunter to kill her stepdaughter... talk about overreacting! The hunter can't go through with it and just sends Snow White away into the forest where she eventually finds a house and makes herself at home. The the owners of the house, the seven dwarfs, come home and totally freak, but because she's hot they totally accept her. Then the evil queen learns from the mirror that Snow White is still alive, so devises an odd plan to get rid of Snow White in the form of conjuring up a magic poison apple that will put Snow White in a coma state until she is kissed by her true love. Erm... okay, she couldn't just use arsenic or something? Why go through all that trouble of making a magic poison which can be easily overturned when you can just use a normal poison that will make the kill permanent? Anyway, that's about the whole story right there, so there's a whole bunch of filler content to get a running time of 84 minutes. Snow White running through the forest, Snow White and her animal pals cleaning the house, the dwarfs trying to figure out who was in her house, and the dwarfs washing up for dinner are all good examples of scenes that, to me, went on a lot longer than they needed to be. Another thing that I didn't remember was how annoying Snow White's singing voice is. Even my wife was shocked. On the good side, the movie is beautiful. The film was obviously restored and corrected, because the colors are bright and crisp and and it looks so clean. Words can hardly do it justice. So even if there isn't much story going on, just watching the animation is entertaining enough. I would love to see the old Transformers cartoon given this kind of treatment. I can only imagine what it would look like on a Blu-ray player. So there it is. Snow White. You know it. I would have liked more story, but you probably love it. This is a great version of the film, but lacks the expected extra features unless you happen to own a Blu-ray player.